Graves raised with and Tran called with . The flop gave Graves a pair and an open-ended straight draw and Tran a gutshot draw along with his overcards. Graves bet 375,000, and as soon as Tran announced he was all-in Graves made the call. The on the turn and on the turn missed Tran's hand and Michael Graves, who came to the table with the chip lead and laid low early on before making his move, won the tournament, the World Series of Poker bracelet, and $742,121. Theo Tran, who played a creative and aggressive game and made some remarkable plays down the stretch, takes home $387,193 as our runner-up. But through no fault of his own. Graves raised with and Tran called with . The flop came and Graves bet 350,000. Tran moved in, Graves called and looked to be drawing dead to a four. But the turn and river came and those cards played along with the Eight on the board to negate Tran's bigger kicker. The two players chopped the pot instead of Tran doubling up. So far the play has favored Tran. After Graves made a 325K raise, Tran moved in with A-Q and Graves instantly mucked his cards. On the next hand, Tran picked up A-K and won the blinds and antes with a raise. And on one of those hands that feels like a fist slamming into your gut. Michael Graves raised with and Luman looked down at . Running low on chips there was only one move to make and Luman pushed in his stack, and after Theo Tran folded Graves made the call and saw that he was dominated. The flop gave Graves a gutshot straight draw, and after the turned Luman had to watch as the dealer peeled the off the deck and send him crashing out of the tournament. It was a cruel way for the day to end for the former chip leader, but Luman takes home $224,249 for finishing today in third. With the board reading Michael Graves made a 400K bet on the river holding two pair with . Theo Tran called Graves on the flop and turn with , and as Graves made the bet Tran started stacking and restacking his chips, trying to decide what to do. 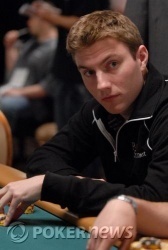 Folding didn't seem to appeal to him as he looked over the board, looked at Graves, and looked back at his cards. Tran finally made the call and looked dismayed when he saw Graves turn over his two pair. That hand dropped Tran's stack down to 1.98 million and lifted Graves to the chip lead with 3.4 million. Luman raised with and called when Graves re-raised with . Both players paired their Ace on the flop, and Luman chose to call Graves' bet. He also called when the turned, which gave Luman a flush draw and Graves top two pair. The hit on the river and again Graves led out, and after thinking it over Luman chose to call once again. And after seeing that he'd trailed the entire hand Luman's stack was reduced to 960,000. Michael Graves made your standard button raise with a better-than-standard starting hand-- . 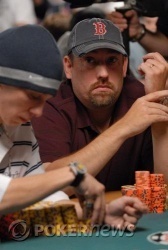 Shawn Luman looked down at in the big blind and pushed out a 550K bet. Graves didn't take long to move all-in, and that prompted Luman to take a nice long visit to the tank. He stayed there for about five minutes before giving up his hand and a big chunk of his stack. 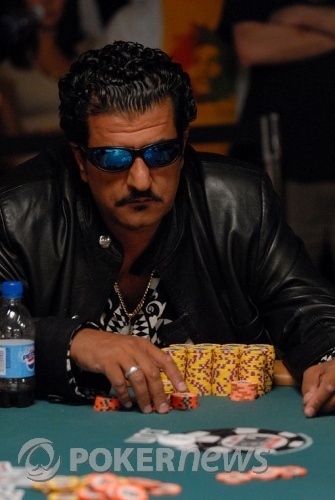 Sometimes No-Limit Hold'Em devolves into preflop shovefests, where players try to avoid making decisions by letting the cards settle the matter. The following hand does not fall into that category. Theo Tran limped on the button with and Michael Graves called with . Shawn Luman raised from the big blind with and after Tran made the call Graves decided to get out of the way. The flop missed both players, but after Luman checked Tran bet 350,000. Luman called. When the turned Luman came alive and let out for 400,000. And now Tran went into the tank. He didn't have much left behind, if he folded he'd be severely short-stacked, but if he moved in he might be drawing dead. He thought a long, long time before announcing all-in and pushing his chips forward. Now Luman was put to the decision, but there wasn't much to decide. He tossed his cards in the muck and Tran slapped his cards down on the felt, showing his bluff. He enthusiastically scooped the massive pot with both arms and is now back in the chip lead with 2,750,000.